We offer accommodation in Anton Center on the Vistula Region in comfortable and modern (1, 2 or 3 people) rooms with shower, LCD TV, satellites television, Wi-Fi and mini-bar. There is a dining room and lounge area. 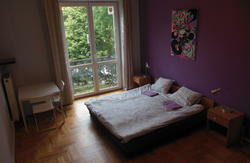 The hostel is located in one of the most picturesque parts of the city center. Nearby is the Copernicus Science Center, and less than 2 km the historic old city with the royal palace. Anton Center is also the perfect solution for business travel, as we also have a conference room and office facilities to be used for training and conferences. At your service: 5 rooms with double bed, 3 doubles and 3 triples. Anton Center offer high quality standard and modern design at a competitive price. You can find hear peaceful atmosphere and high-quality service. Our hotel rooms are 365 days open. Convenient location, close to the city center (just 5 minutes by bus/tram) and places like the Copernicus Science Centre, National Stadium or Hulakula - Entertainment Center, are certainly an advantages of our facility. From the airport to get to our hostel the best way is to use the SKM (urban rail) no. 2. Get off at the station Warsaw Powisle. Then follow the map to the right up to the street Dobra, then take the second street on the right - street Smulikowskiego.